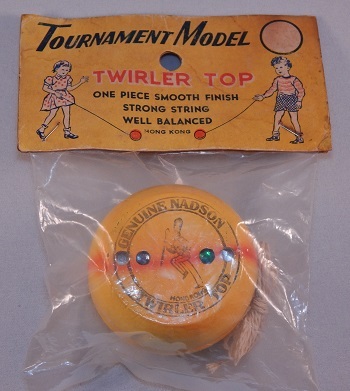 The wooden Nadson Twirler Top with four jewels on one halve: two clear, one very pale blue, and one emerald. The red stripe applied to both halves do not line up properly. This quality control issue is common for this yo-yo model. Made in Hong Kong.